both sustain itself and grow. This process of fire is now called the "fire tetrahedron." See figure 12-3. 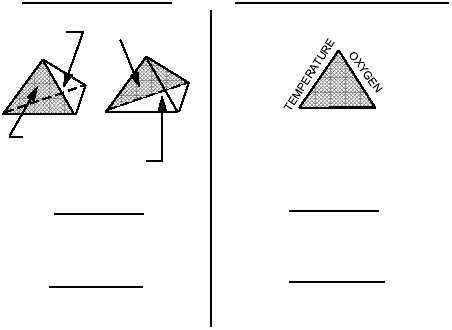 The most common method of controlling or extinguishing a fire is to eliminate one or more of sides of the tetrahedron. This can be accomplished by the following methods. 1. Smotheringremoving the oxygen 2. Coolingremoving the heat 3. Starvingremoving the fuel or combustible matter There are two terms you need to understand about fires. These are the fire point and the flash point. The fire point of a substance is the lowest temperature at which its vapors can be ignited and will continue to burn. At this temperature, the vapor will ignite spontaneously in the air. Also, substances don't have to be heated to this ignition temperature throughout in order to ignite. The flash point of a substance is the temperature at which the substance gives off enough vapors to form an ignitable mixture with the air near the substance's surface. An ignitable mixture is a mixture within the explosive range. The mixture is capable of spreading a flame away from the source of ignition when ignited. For example, fuel will spontaneously ignite when a portion of it (or its vapors) is exposed to temperatures around 500°F (ignition temperature). It is capable of being touched off by a match or spark at temperatures down to -5°F (fire point). It will also flash across the surface at temperatures from -5°F down to -45°F (flash point). From these examples, you can readily see that fuel has a low flash point and is easily ignited. Fuel is a constant fire hazard around aircraft. A spark, heat caused by friction, or an electrical discharge could supply enough heat to cause fuel to flash. CLASSES OF FIRE Different types of fires are combated by different means. It is important that you know how to identify the various types of fires and understand why each type must be combated in a specific way. Class A Class A fires occur in combustible materials, such as bedding, mattresses, books, cloth, and any matter that produces an ash. All fires of this class leave embers, which are likely to rekindle if air comes in contact with them. Class A fires must not be considered extinguished until the entire mass has been cooled below its ignition temperature. Smothering (removing the oxygen) is not effective for class A fires because it does not lower the temperature of the smoldering embers below the surface. The extinguishing agents most effective for class A fires are solid water stream, both high- and low-velocity fog, CO2, and water immersion. 12-2 FLAMING COMBUSTION AND SURFACE GLOWING COMBUSTIONN TEMPERATURE OXYGEN FUEL FUEL NO CHAIN REACTION FUEL IS IN FORM OF INCANDESCENT SOLID OXYGEN IS AT INTERFACE OF GLOWING FUEL UNINHIBITED CHAIN REACTION OF COMBUSTION PROCESS DIFFUSION & CONTINUOUS REIGNITION & AUTOMATICALLY OBTAINED AT FLAME TEMPERATURE LEVELS FUEL IS IN FORM OF VAPOR AND GAS Anf1203 3 Figure 12-3.Tetrahedron and fire triangle.